This Kadai chicken recipe is a real knock out, a delicious and flavorful restaurant style dish that is very popular all over India. Kadai chicken is a Classic Indian dish, prepared in the traditional Kadai (a must have wok/ pan in all Indian households) and hence the name. Juicy chicken pieces are cooked in a spicy rich gravy with succulent bell peppers. The whole spices and herbs add to the flavors and the tangy tomato based gravy makes it extra delicious. My son Joel likes smooth gravies better than the coarse ones, so whenever we eat out, he would go for Butter chicken, Punjabi Chicken Curry, Butter paneer, Palak Paneer, Chicken/ Paneer Korma or Kadai chicken. Like most of the Indian curries, this is also based on onion tomato gravy. I love the aromatic spices, the julienned ginger and the fried Bell Peppers. Everything about Kadai dishes is awesome! 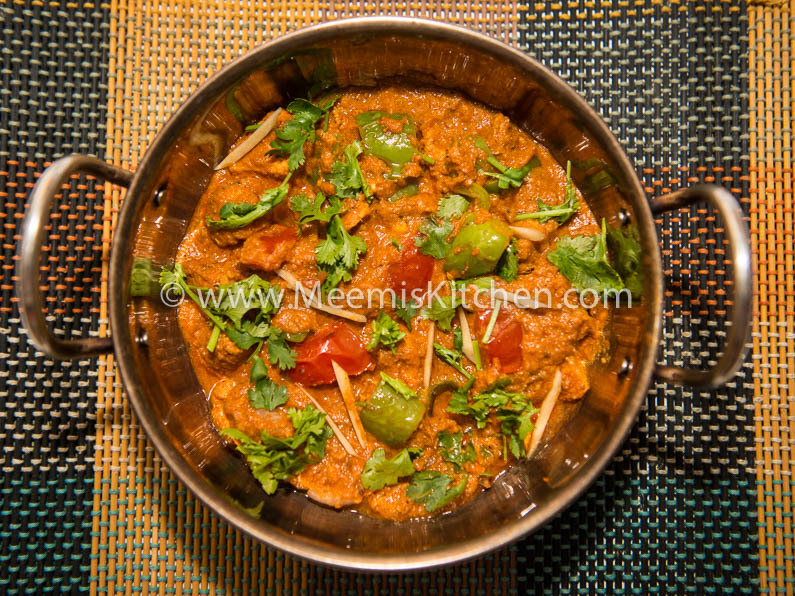 You will definitely enjoy my Kadai Mushroom recipe, which is also lipsmacking good! Also try my other exotic chicken recipes like Chettinad chicken curry, Peshawari chicken, Ginger Chicken, Chicken with Thengakoth, Nadan Chicken curry, Kerala chicken fry, Pepper chicken, Thattukada style chicken fry, Chicken 65 etc. I was shuffling through my collections, when I came across this easy to prepare Kadai Chicken recipe. It turned out finger licking good. Try out this Kadai Chicken recipe without any prejudices, it is really simple and you will thank me for this wonderful recipe. It can be served with Whole wheat Naan or Simple Pulao, Corn Pulao or Paneer Pulao. Ginger garlic paste : 1 ½ tbsp. Pepper corns : 10 nos. Cut chicken breast into small cubes. Heat Kadai, Sauté the onion in oil till it turns golden brown. Add ginger garlic paste. Grind this onion, cashew nuts, and all other masala to a fine paste. Mix with curd and tomato puree. In the same kadai fry the ground paste for some time. Add chicken pieces, salt and little water, cover and cook on small flame, till it is done. Stir in between. Garnish with coriander leaves and fried cubes of capsicum, onions and tomatoes (optional). Serve hot with Naan or Pulao. It is good with Naans, Roti, Veg Pulav with raw salad. You can add Capsicum, tomatoes and Onions cubed and stir fried for garnishing on top. Use colorful capsicum- yellow and red for maximum appeal and taste. Please try this recipe and let me know whether you liked it. God bless!! Very happy to know that you tried. Hope Jacob liked. Thank you for your comments. 🙂 Happy to know you liked. That tastes really good especially with roti.